Ziggy and the Starfish is a sculptural installation composing of a mechanical waste processing crab, a film exploring the diversity of sexuality in the ocean, scientific interviews and moving singing stones dating back millions of years. The newly commissioned work of Anne Duk Hee Jordan looks at sexuality from the perspective of marine life in a wholehearted environmental consumption where many causalities influence each other. Through pollution, traffic, oil spills, oil platforms, the sea began to change. The climate change in the hydrosphere determines the sexuality of the ocean animals. An almost invisible, yet undeniable change in the environmental and sexual world occurs. We can pretend the world goes on but we all go back to another big extinction. We are heading back to the end. 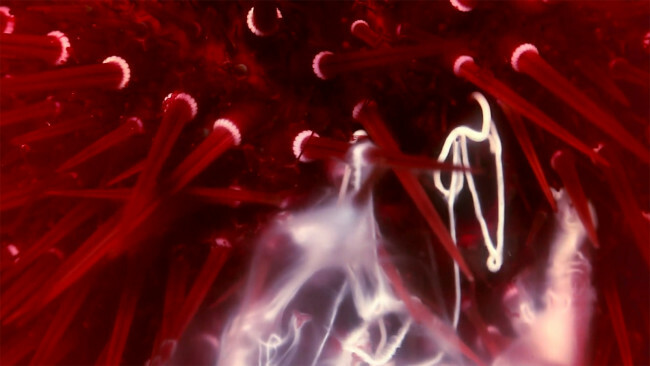 Facing the dreadful facts about global warming by zooming in on the perspective of aquatic life, Anne Duk Hee Jordan, created Ziggy and the Starfish, a sculptural environment exploring an alienate universe full of strangeness, changes and adaptation. 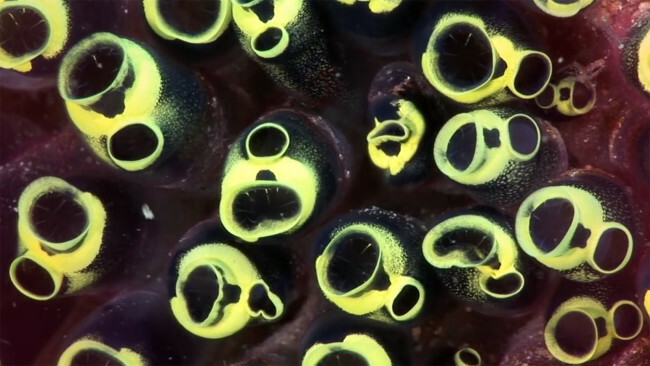 After a month of free diving, many hours of underwater filming, interviews with marine biologists and geologists on the Basque coast, the artist tells the story of reproduction and decay and a sexuality way beyond our own imagination, while examining the relationship between nature, time and human intervention. Anne Duk Hee Jordan: Ziggy and the Starfish. A documentary. Opening, attended by the curator and the participating artists: Friday, 21st October 2016, at 7 pm. Agency of Living Organisms explores the communication between different living organisms throughout the lithosphere, atmosphere, biosphere, and hydrosphere. It manifests itself as an artistic cosmography in close collaboration with artists exhibiting mainly new works specially designed for this project. The invited ‘agents’ share a questioning attitude towards the environment and its constructed representations. A new kind of ‘nature’ is being created, one that is shaped and categorized by humanity. Today the technosphere and the biosphere interact to form neo-natural phenomena. As we find ourselves amidst pressing environmental and social crises, this project not only seeks to investigate our position in regards to our natural and built environment (the way we consume or sustain it), but also to lend insight into the perception of the self through the eyes of the ‘others’ and to forge an understanding of the complex networks within which we are embedded. In response to the theme in question, the project proposes an exhibition with interconnected commissioned and existing works as a social living sculpture, an expanding format that opens the walls of the exhibition halls into the urban, natural and ‘online’ environment. The show will include work by Anne Duk Hee Jordan, Esther Kokmeijer, Gerard Ortín, Iain Ball, Iratxe Jaio and Klaas van Gorkum, Lara Almarcegui, Maider López, New Mineral Collective, Tere Recarens, Tue Greenfort, El Conde de Torrefiel, Koenraad Van den Driessche and Nader Koochaki. Curated by Pauline Doutreluingne. Please find the curatorial statement by Pauline Doutreluingne, Tabakalera Curator 2015, here. NOWs: “I” by Alvaro Urbano curated by Treti Galaxie in collaboration with the National Cinema Museum of Turin at Mole Antonelliana, Turin, Italy 11am (by reservation only) In this project, the notion of the ‘solo show’, i.e. an exhibition of works held for public view by a single artist, is turned on its head: it is in fact an exhibition designed to be viewed by a single spectator. A choice both provocative and intimate at the same time, in line with the curatorial approach adopted by Treti Galaxie, which often questions the relationship between contemporary art and its audience. The title ‘I’, as well as referencing the number one in the Roman numeral system and the first person singular pronoun, and therefore the particular viewing mechanism of the project, is also the last letter of the cryptogram written in an alphabet of ancient Icelandic runes which is found by Professor Otto Lidenbrock, the main character in the novel ‘Journey to the Centre of the Earth’ by Jules Verne. In the story, once deciphered, the message contains instructions on how to reach the centre of the planet. On the basis of this cryptogram, the artist has constructed a far-reaching project entitled ‘My Boy, with Such Boots we may Hope to Travel Far’, which consists in transforming the letters of the message into sculptural groups distributed throughout various places around the world and created with materials characteristic of the areas in which they are installed. The initial stage of the project witnessed the creation of the first 15 letters of the message, positioned permanently between Merano and Tyrol. In ‘I’, Urbano’s ambitious project is brought together as a whole in the spaces of the Mole Antonelliana. The exhibition may be considered a sort of rite heralding the transformation of an idea into a work of art: a particular work which, in order to be viewed in its entirety, will require a long journey around the world. The spectator, along the way up from the ground floor to the spire of the Mole, via the narrow spaces along the inside walls of the cupola, will come into contact with the entire cryptogram, presented in various forms, such as sounds, drawings and installations. Through his/her subjective experience, the spectator will be able to mentally reconstruct the various parts of the project, thus serving as the medium for the ideal transformation of ‘My Boy, with Such Boots we may Hope to Travel Far’ into a signal which, through the particular antenna-shaped architecture of the Mole, will be ‘transmitted’ and broadcast around the world. With the development over time of ‘My Boy, with Such Boots we may Hope to Travel Far’, the sculptures positioned in various places around the planet will become the concrete manifestation of this signal. The event is open to a limited number of participants, and foresees the participation of a maximum of 40 people: the sole spectator of the exhibition will be identified through the distribution of chocolate bars, one of which will contain instructions on how to access the exhibition. In order to book, it is necessary to send a participation request to the address info@tretigalaxie.com on 27 October 2016 between 8am and 8pm with the words “SOLO SHOW” in the subject line. Thanks to its collaboration with the National Cinema Museum of Turin, Treti Galaxie presents ‘I’: a solo show by Alvaro Urbano staged in the evocative and mysterious spaces of the Mole Antonelliana. › Alvaro Urbano examines the borders between architecture, fiction and utopia through the use of various media, including video, performance, site-specific installation and sculpture. In his research, Urbano conceives of architecture as the translation of thought into a tangible structure, a structure which is then built with the aim of influencing the lives and the perception of the people it houses. The artist, drawing on forms of thought apparently far-removed from those regarding the construction of artificial environments, such as storytelling, dreaming and utopian thought, works to bring these elements back to architecture, in the attempt to disrupt its paradigms and original functions. Alvaro Urbano:"I", 2016,. Installation view, Mole Antonelliana / Museo Nazionale del Cinema. Turin. Courtesy of Treti Galaxie. Photos by Delfino Sisto Legnani	NOWs: “I” by Alvaro Urbano curated by Treti Galaxie in collaboration with the National Cinema Museum of Turin at Mole Antonelliana, Turin, Italy 11am (by reservation only) In this project, the notion of the ‘solo show’, i.e. an exhibition of works held for public view by a single artist, is turned on its head: it is in fact an exhibition designed to be viewed by a single spectator. A choice both provocative and intimate at the same time, in line with the curatorial approach adopted by Treti Galaxie, which often questions the relationship between contemporary art and its audience. The title ‘I’, as well as referencing the number one in the Roman numeral system and the first person singular pronoun, and therefore the particular viewing mechanism of the project, is also the last letter of the cryptogram written in an alphabet of ancient Icelandic runes which is found by Professor Otto Lidenbrock, the main character in the novel ‘Journey to the Centre of the Earth’ by Jules Verne. In the story, once deciphered, the message contains instructions on how to reach the centre of the planet. On the basis of this cryptogram, the artist has constructed a far-reaching project entitled ‘My Boy, with Such Boots we may Hope to Travel Far’, which consists in transforming the letters of the message into sculptural groups distributed throughout various places around the world and created with materials characteristic of the areas in which they are installed. The initial stage of the project witnessed the creation of the first 15 letters of the message, positioned permanently between Merano and Tyrol. In ‘I’, Urbano’s ambitious project is brought together as a whole in the spaces of the Mole Antonelliana. The exhibition may be considered a sort of rite heralding the transformation of an idea into a work of art: a particular work which, in order to be viewed in its entirety, will require a long journey around the world. The spectator, along the way up from the ground floor to the spire of the Mole, via the narrow spaces along the inside walls of the cupola, will come into contact with the entire cryptogram, presented in various forms, such as sounds, drawings and installations. Through his/her subjective experience, the spectator will be able to mentally reconstruct the various parts of the project, thus serving as the medium for the ideal transformation of ‘My Boy, with Such Boots we may Hope to Travel Far’ into a signal which, through the particular antenna-shaped architecture of the Mole, will be ‘transmitted’ and broadcast around the world. With the development over time of ‘My Boy, with Such Boots we may Hope to Travel Far’, the sculptures positioned in various places around the planet will become the concrete manifestation of this signal. The event is open to a limited number of participants, and foresees the participation of a maximum of 40 people: the sole spectator of the exhibition will be identified through the distribution of chocolate bars, one of which will contain instructions on how to access the exhibition. In order to book, it is necessary to send a participation request to the address info@tretigalaxie.com on 27 October 2016 between 8am and 8pm with the words “SOLO SHOW” in the subject line. 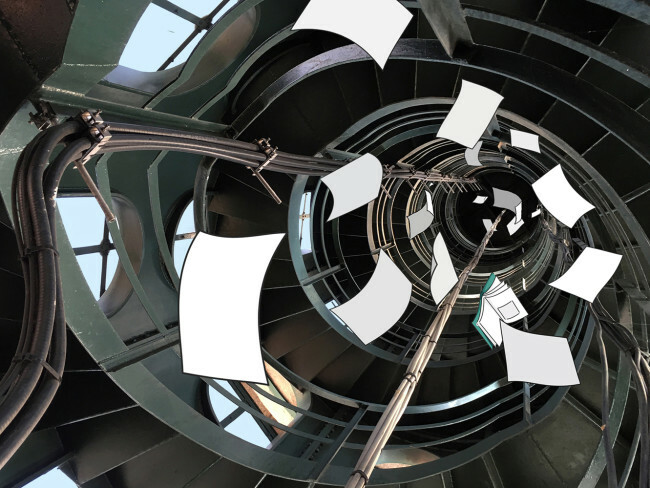 Thanks to its collaboration with the National Cinema Museum of Turin, Treti Galaxie presents ‘I’: a solo show by Alvaro Urbano staged in the evocative and mysterious spaces of the Mole Antonelliana. › Alvaro Urbano examines the borders between architecture, fiction and utopia through the use of various media, including video, performance, site-specific installation and sculpture. In his research, Urbano conceives of architecture as the translation of thought into a tangible structure, a structure which is then built with the aim of influencing the lives and the perception of the people it houses. The artist, drawing on forms of thought apparently far-removed from those regarding the construction of artificial environments, such as storytelling, dreaming and utopian thought, works to bring these elements back to architecture, in the attempt to disrupt its paradigms and original functions. Alvaro Urbano:"I", 2016,. Installation view, Mole Antonelliana / Museo Nazionale del Cinema. Turin. photo: Lillevan.com 2008-2016	NOWs: Gletschermusik Musik: Robert Lippok & Askat Zhetigen (Kirgisien). Video: Lillevan 20:00 h Roter Salon in der Volksbühne | Rosa-Luxemburg-Platz | 10178 Berlin/Mitte Gletschermusik (Glacier Music) uses the sounds and images of Central Asia’s melting glaciers as source material and inspiration. Berlin’s Robert Lippok & Kyrgyz musician Askat Jetigen were invited to create an audio-visual performance and a series of concerts. The project promotes the exchange between science and the arts, creating awareness of the human-induced deterioration of our pristine environment and was instigated by the Goethe-Institutes in Tashkent and Almaty. The album crowns the 12 month traveling festival through the countries of Central Asia in 2013 featuring multimedial concerts, promoting dialogue between artists, scientists, nationalities, genres and traditions. The music Robert and Askat created together is magical and thematically relevant to the theme of melting glaciers, a fascinating blend of ancient Kyrgyz tradition and new musical ideas. After the first concerts it was obvious that a recording must be made and released, and here we are: the Gletschermusik recordings, also featuring a track by pianist SooJin Anjou – the piano in dialogue with the sounds of Central Asia’s melting glaciers. Gletscher Musik initiated by Goethe Institut Almaty & Tashkent explored Central Asia’s melting Glaciers, using the recorded sound of the glaciers a range of art events and symposia spread over 4 years, 5 countries and 60 artists. Featuring Omnibus Ensemble, Gebrüder Teichmann, Askat Jetigenov, Robert Lippok & Artyom Kim and many others. Tickets kosten 15,- Euro. photo: Lillevan.com 2008-2016	NOWs: Gletschermusik Musik: Robert Lippok & Askat Zhetigen (Kirgisien). 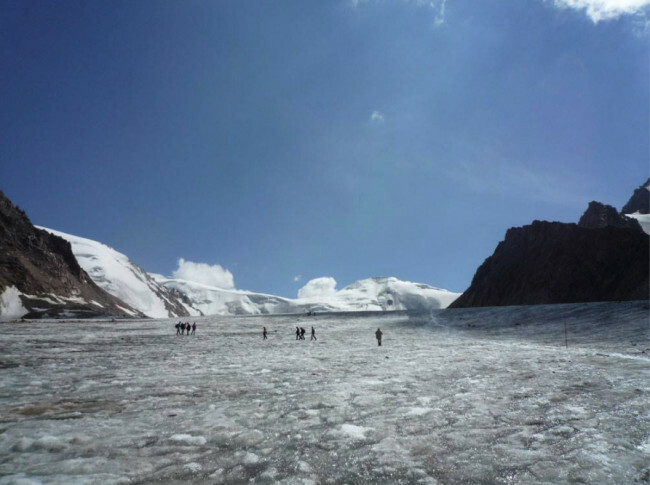 Video: Lillevan 20:00 h Roter Salon in der Volksbühne | Rosa-Luxemburg-Platz | 10178 Berlin/Mitte Gletschermusik (Glacier Music) uses the sounds and images of Central Asia’s melting glaciers as source material and inspiration. Berlin’s Robert Lippok & Kyrgyz musician Askat Jetigen were invited to create an audio-visual performance and a series of concerts. The project promotes the exchange between science and the arts, creating awareness of the human-induced deterioration of our pristine environment and was instigated by the Goethe-Institutes in Tashkent and Almaty. The album crowns the 12 month traveling festival through the countries of Central Asia in 2013 featuring multimedial concerts, promoting dialogue between artists, scientists, nationalities, genres and traditions. The music Robert and Askat created together is magical and thematically relevant to the theme of melting glaciers, a fascinating blend of ancient Kyrgyz tradition and new musical ideas. After the first concerts it was obvious that a recording must be made and released, and here we are: the Gletschermusik recordings, also featuring a track by pianist SooJin Anjou – the piano in dialogue with the sounds of Central Asia’s melting glaciers. Gletscher Musik initiated by Goethe Institut Almaty & Tashkent explored Central Asia’s melting Glaciers, using the recorded sound of the glaciers a range of art events and symposia spread over 4 years, 5 countries and 60 artists. Featuring Omnibus Ensemble, Gebrüder Teichmann, Askat Jetigenov, Robert Lippok & Artyom Kim and many others. Tickets kosten 15,- Euro.